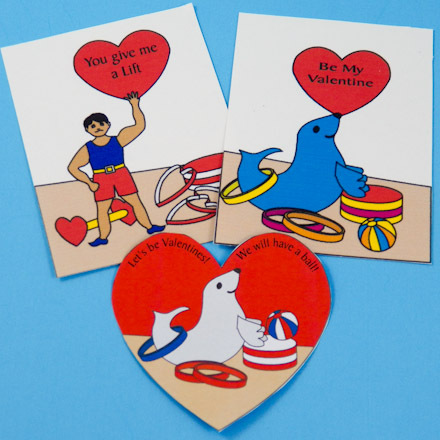 This project features quick and easy Valentine designs that are simple to make and perfect for classroom giving! 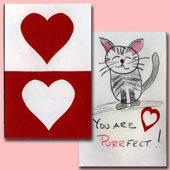 Select from printable Valentine's Day card patterns with either 6 or 9 Valentines to a sheet. There are patterns for printing on paper or cardstock, so you likely have everything needed to make these Valentines on hand right now! Related crafts: Want to make lots of Valentines in a hurry but still show your creative flair? 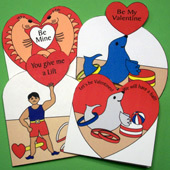 Checkout the cards in the Easy Valentine Cards craft project. 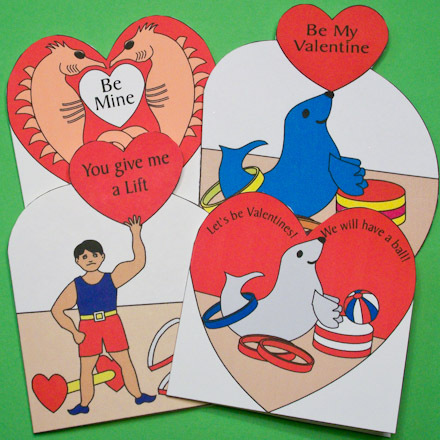 For pop-up cards and more easy to make greeting cards, see the projects listed in Greeting Cards Kids Can Make. This project is rated VERY EASY to do. Choose a pattern to print. Download the pattern and print it on paper or cardstock. There are patterns for two card designs with circus themes. The 6/sheet pattern is best printed on paper, while the 9/sheet pattern works best on cardstock. The 9/sheet patterns have two pages, print on the front and back of a sheet. Both designs are offered in color and black & white. While the color patterns are quicker to make, the black & white patterns allow for the most creativity. Patterns are Adobe PDF files. The Adobe Reader is available for free. All of Aunt Annie's project patterns are designed to be printed on standard letter size paper (8.5"x11" or A4). When printing from Adobe Reader, you may need to select Auto-Rotate and Center or Choose paper source by PDF page size to ensure the best fit. Use crayons, colored pencils or markers to add color to the black & white patterns. Use your imagination! Follow these simple instructions for making your Valentines. Cut: Cut out the six Valentines on the rectangular outlines. Fold: Fold each rectangle in half on the dashed center line. Unfold. For cardstock, before folding score the fold lines using an empty ballpoint pen drawn along a ruler placed on the fold line. Glue: Apply glue to the back of each Valentine and fold to glue the two layers together. If the paper curls, place the Valentines under something heavy overnight or until the glue dries. 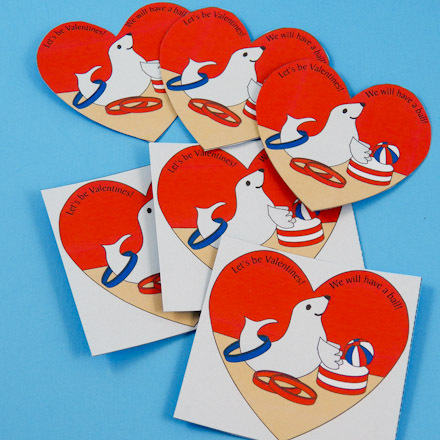 Cut: (optional) For heart-shaped Valentines, trim each Valentine to the heart outline. These Valentines are designed for cardstock, printed front and back. It you are using paper, print the pages to separate sheets of paper and glue together. 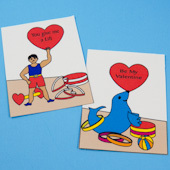 These are super simple Valentines, just cut! Cut: Cut out the nine Valentines on the rectangular outlines. To make the cutting go faster, use a paper trimmer. Write messages on the cards. Decorate the backs of the cards. That's it! Your Valentines are done! Related craft: For larger circus theme Valentines, see the Heart Shaped Cards craft project. Related craft: For easy to make Valentines that allow for a bit more creativity, see the Easy Valentine Cards craft project.